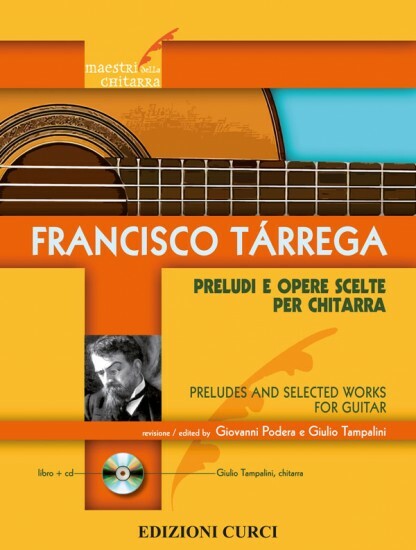 Francisco Tarrega (1852-1909) is the most important Spanish guitarist-composer of the second half of the nineteenth century. This volume collects his 18 Preludes and most celebrated original guitar works: Recuerdos de la Alhambra, Capricho Arabe, Gran Vals, Maria, four mazurkas (Adelita, Sueno, Marieta, Mazurka en Sol), Rosita (Polka), Minuetto, Carnaval de Venecia (Variaciones sobre un tema de Paganini), Estudio en forma de Minuetto, Estudio (Sobre una sonatina de Alard). This revision, by Giovanni Podera and Giulio Tampalini, is based on a careful comparison of the original sources. The enclosed CD features all pieces played by Giulio Tampalini. Great book with great pieces! !